Which Wich’s philanthropic foundation, Project PB&J, was created five years ago with a vision of making the world a better place one PB&J sandwich at a time. This year, with National Peanut Butter & Jelly Day on Tuesday, April 2, Which Wich is teaming up with Hormel Foods and its SKIPPY® peanut butter brand to host a month-long virtual spreading party throughout April to benefit hunger relief efforts in local communities. Both companies are encouraging everyone to join the campaign by making PB&J sandwiches that can be donated to local hunger relief organizations. For every sandwich that is made and donated, Which Wich and Hormel Foods and its SKIPPY® brand, will donate a dollar up to $20,000 to hunger relief efforts nationally. The “Spread The Love” campaign will run from Monday, April 1 through Tuesday, April 30. During the campaign, anyone who creates and donates PB&J sandwiches can log those donations at https://projectpbj.org/spreadthelove and use the hashtag #SpreadTheLove to contribute to the cause. A ticker will keep track of the number of PB&J sandwiches donated across the country. At the end of the campaign, Which Wich will contribute $1 for every PB&J sandwich donated to Project PB&J, and Hormel Foods will match the final donation total up to $20,000. Project PB&J uses donations to provide food and aid in communities during times of great need, such as during recovery efforts after Hurricane Harvey in Texas and Hurricane Irma in Florida. 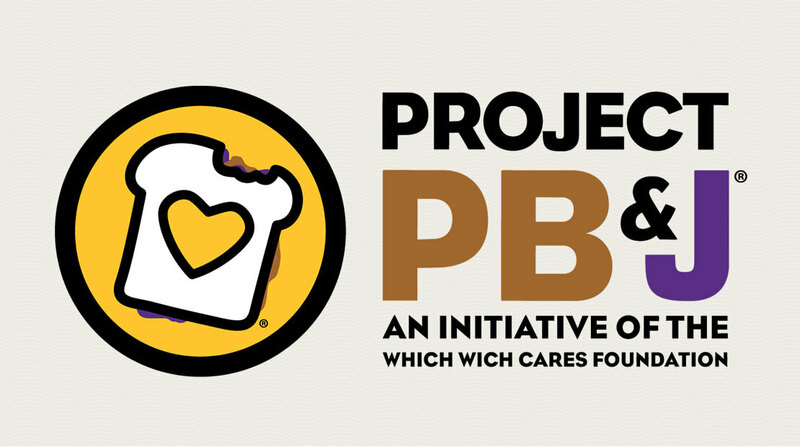 Founded in 2014 as part of the Which Wich Cares Foundation, Project PB&J® was established as a simple but important way to fight hunger. Under the program, for every PB&J sandwich purchased by a customer at Which Wich, one PB&J sandwich is donated to a local cause and another is banked for the global fund to assist in situations with a larger scale need. Since its launch, nearly one million PB&J sandwiches have been donated to organizations in local communities including The Salvation Army, Boys & Girls Club, Big Brothers Big Sisters, as well as hundreds of local charities, churches, and those working to help feed those in need. The inspiration for Project PB&J came from Which Wich founders Jeff and Courtney Sinelli’s shared love of the sandwich and its power to provide comfort and nourishment in times of need. Teams participating in Project PB&J “Spreading Party” events have broken the Guinness Book of World Records for “Most sandwiches made in one hour” twice. In 2017, the program provided aid during recovery efforts after Hurricane Harvey in Texas and Hurricane Irma in Florida. To learn more about Project PB&J, visit https://projectpbj.org/. Which Wich® Superior Sandwiches was founded in Dallas in late 2003 by restaurant entrepreneur, Jeff Sinelli. The national sandwich franchise chain is best known for its customizable sandwiches, creative ordering system, and personalized sandwich bag. In 2018, Which Wich was ranked as the #9 sandwich brand on Entrepreneur Magazine’s Top 200 Food and Restaurant Franchises of 2018. In 2017, Which Wich ranked as #9 on Fast Casual’s Top 100 Movers and Shakers and landed at #20 on the Franchise Times Fast & Serious list. In 2016, Restaurant Business named Which Wich the first winner of its Future 50 Pacesetter award. Which Wich is the recipient of a Nation’s Restaurant News MenuMasters “Healthful Innovations” award and has been named by Forbes as one of their “30 Best Franchises To Buy.” Which Wich currently has 500 locations open or in development in 40 states and 12 countries. For more information, visit www.whichwich.com.